No, this is not posed or photoshopped. 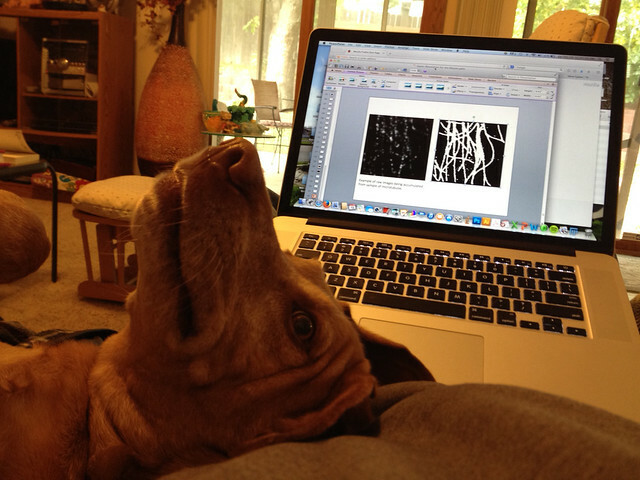 But it is apparent that Ginger is somewhat less enthusiastic about calculations in single molecule imaging than I am. This entry was posted in humor, research, science and tagged competing interests, dogs, dSTORM, Ginger, Labrador Retriever, science, single molecule imaging, vizsla. Bookmark the permalink. I dunno – there’s a certain “woah, man – you’re totally blowing my mind with this stuff (cookie plz? )” look about Ginger’s face. You may be right. The spatial resolution of treats over time is definitely a topic of interest to her.